Rosemary was born in Limavady and is largely a self taught artist. When she first began painting she was inspired by Irish artists such as Neil Shawcross, Basil Blackshaw and Brian Ballard. 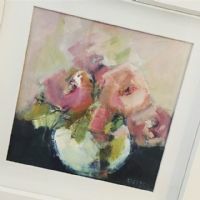 Within ten years she had§ become a prolific artist winning multiple Art Society Awards and has exhibited work with Royal Ulster Academy. Rosemary’s expressive marks have created an instantly recognisable and fearless style, working into and on top of the paint she lets the paint itself shape the final outcome.